After I spent the last week running around trying to make sure I had everything ready for the shower, I had to do MORE running around. You know how it goes - without fail there are always one or two small tasks that you've forgotten about and need to do last minute. And this outfit was perfect for for that. 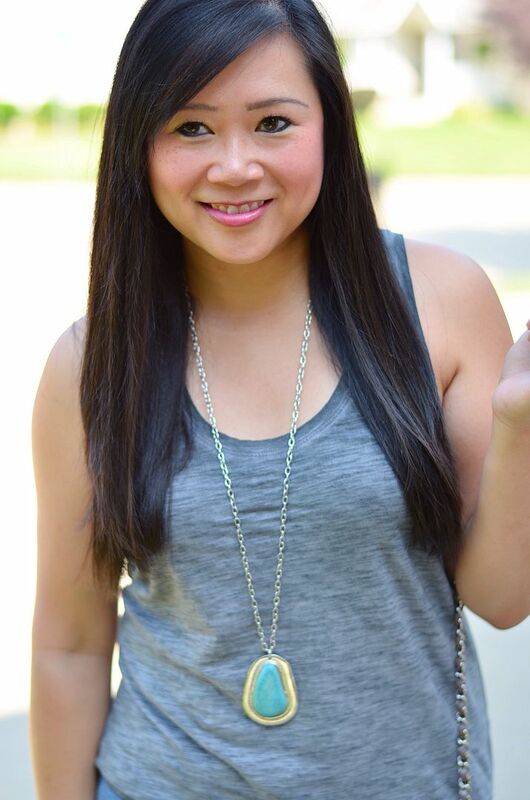 It's the perfect alternative to a ribbed tank - sometimes ribbed tanks are not super flattering for my problem areas. Perhaps I will revert back to them later on once my workouts start paying off, but for now, I love how easy this tank is. It's relaxed but not baggy. I ended up ordering it in two more colors - black and white. I'm sure they will get tons of use! Sometimes the best outfits are the ones that are stripped down like this. Nothing fussy, but just enough to feel cute. And, a statement bag always helps when all else fails. 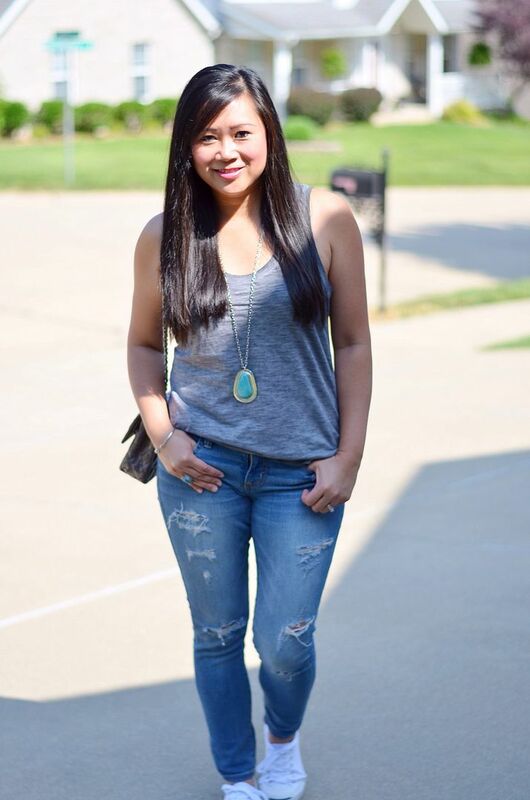 Love the casual gray tank and ripped jeans! That necklace pairs perfect with the ring! Love this! Sometimes less really is more, I may be talking about the same thing on my blog today too lol. Great minds. I have been eyeing that tank for the exact reasons you said...relaxed but not baggy. It looks perfect on you. I have a workout tank like that and I have wished I had an every day tank like it so maybe this one will be "the one!" And I can't resist that neon peach! Love that color! I love the distressed jeans and simple tank. That bag though…AMAZING! It really makes the outfit perfect! 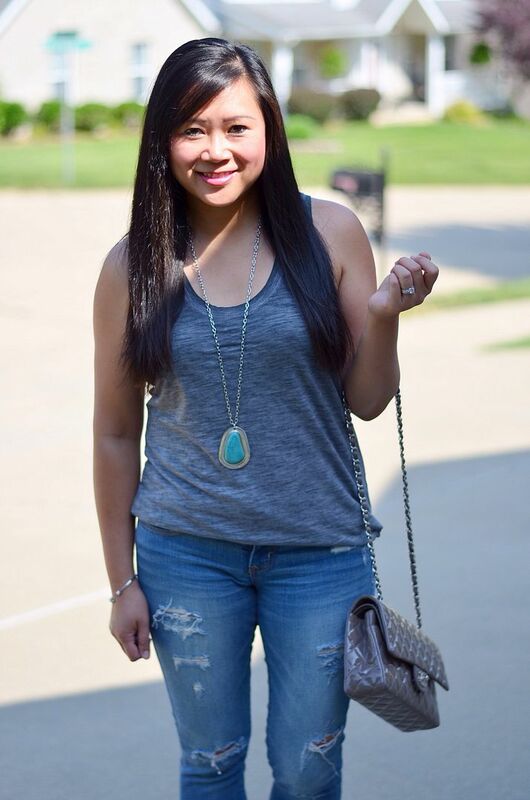 Love this tank it looks great with the distressed denim! Totally swooning over that bag! That tank really fits you so well and I may need to go check it out now! I love this cute and casual look! That necklace is fabulous - great find! 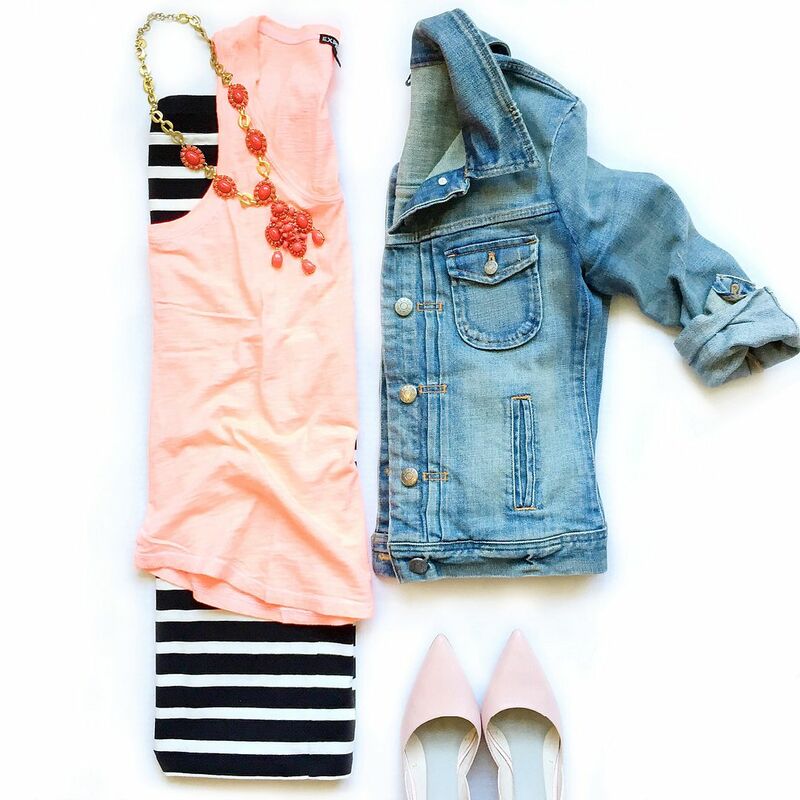 I LOVE the flat lay outfit that you put together! Peachy pink and black have always been one of my favorite color combinations, and those shoes are wonderful! Gah! So great! I got a couple tanks from express too in black and white. Adore that bag! Love this laid back tank! Perfect look to recreate during my chill weekend errand runs. I need that tank first though!